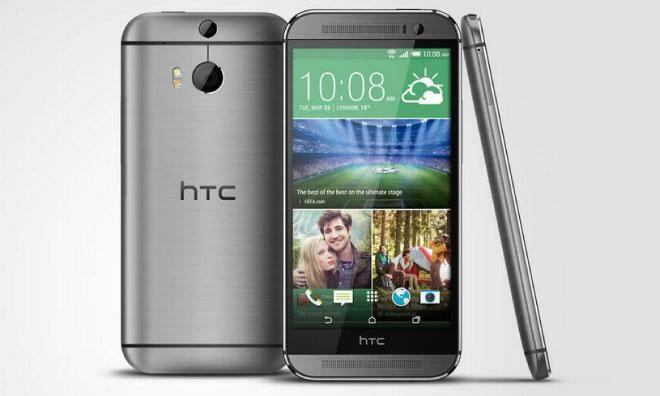 Taiwanese handset maker HTC on Tuesday unveiled its latest flagship device intended to take on Apple's iPhone: the HTC One M8, with a larger screen, higher-spec internals, a depth-sensing camera and dual LED flash —but no biometrics. The most noticeable change from last year's model is the larger display, which is up 0.3 inches diagonally to 5 inches. That extra real estate brings with it a slight increase in overall dimensions and an extra 17 grams of weight, though the M8 retains the same 0.37-inch profile as its predecessor. HTC retained much of the last HTC One's industrial design, though they have moved to a "unibody" construction that eschews the plastic buffer between the case and display. Internally, the M8 is driven by Qualcomm's Snapdragon 801 quad-core processor clocked at 2.3 gigahertz. The handset sports 2 gigabytes of RAM and ships with Android 4.4 "KitKat" with HTC's Sense and BlinkFeed customizations, though a pure Google edition will be available as well. 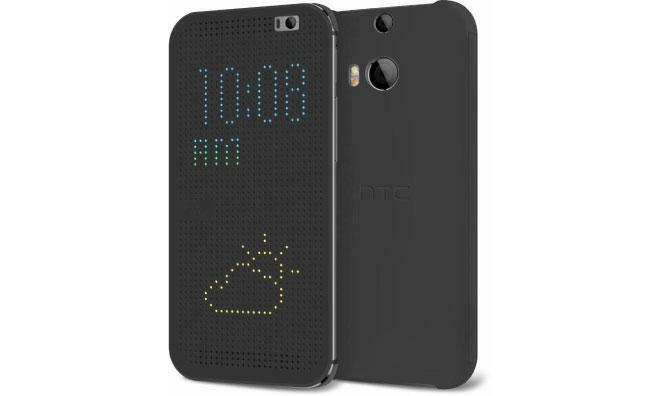 HTC's dynamic Dot View case for the M8. The Dot View can display calls, texts, the time, and the weather. The M8's new dual rear camera system, which HTC aptly calls Duo Camera, captures information about the depth of objects in the scene alongside the actual image. This will allow users to easily select the background and foreground for editing, as well as adjust focus after the photo is taken. Apple has been seen working on similar post-shot focus technology, though with a much different implementation. Apple's approach, as shown in patent applications, involves a moveable lens placed inside the camera module itself rather than an exterior sensor. The new camera system also sports a dual-tone flash that automatically selects a color based on available light and the ability to capture slow-motion video, much like the features introduced in the iPhone 5s. Borrowing a page from rival Samsung, the M8 also ships with gesture recognition technology. Swiping in the air will activate the phone, putting it up to your ear will automatically answer a call, and double-tapping turns the phone off. Additionally, HTC has added a new "extreme power saving mode" which the company says can give users an additional 15 hours of runtime at 5 percent battery, including receipt of text messages and phone calls. The company also built in a low-power sensor hub for fitness apps, similar to the iPhone 5s's M7 motion coprocessor. Interestingly, the M8 does not include biometrics of any kind. The field has been reenergized by the success of Apple's Touch ID system, and Samsung added a fingerprint sensor of its own to the upcoming Galaxy S5. HTC will ship the M8 in three colors —Gunmetal Gray, Glacial Silver and Amber Gold —in versions for more than 230 mobile operators. The handset will fetch $649 without a contract, with on-contract devices going for $199 or $249 depending on the carrier.